The Northern Alberta Institute of Technology (NAIT) is a technical school, located in Edmonton, AB. They specialize in technical programs and hands on programs for post secondary students, allowing students to learn practical skills, with one of these programs being the Culinary Arts program. Since 2009, they have invited a well-known chef to be the Hokanson Chef in Residence, allowing young chefs the opportunity to learn from with one of the world’s best chefs, first hand. This also exposes the students to different cooking styles, trends and techniques. 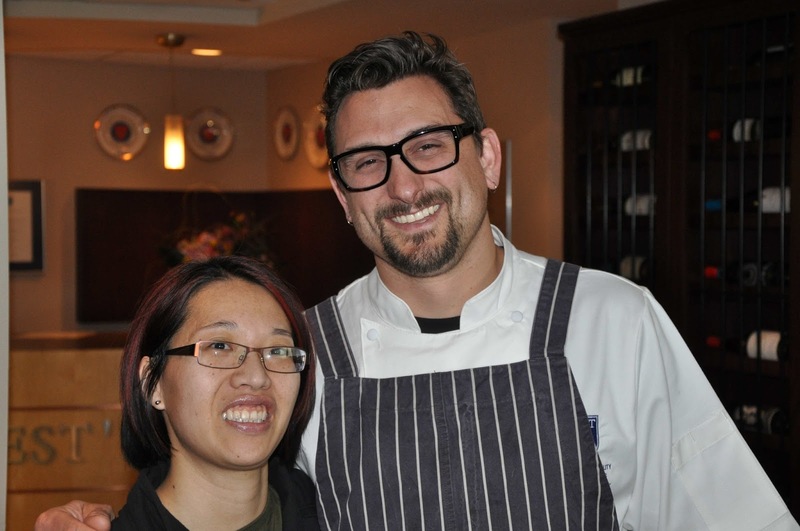 This year, the Chef in Residence was Chris Cosentino. 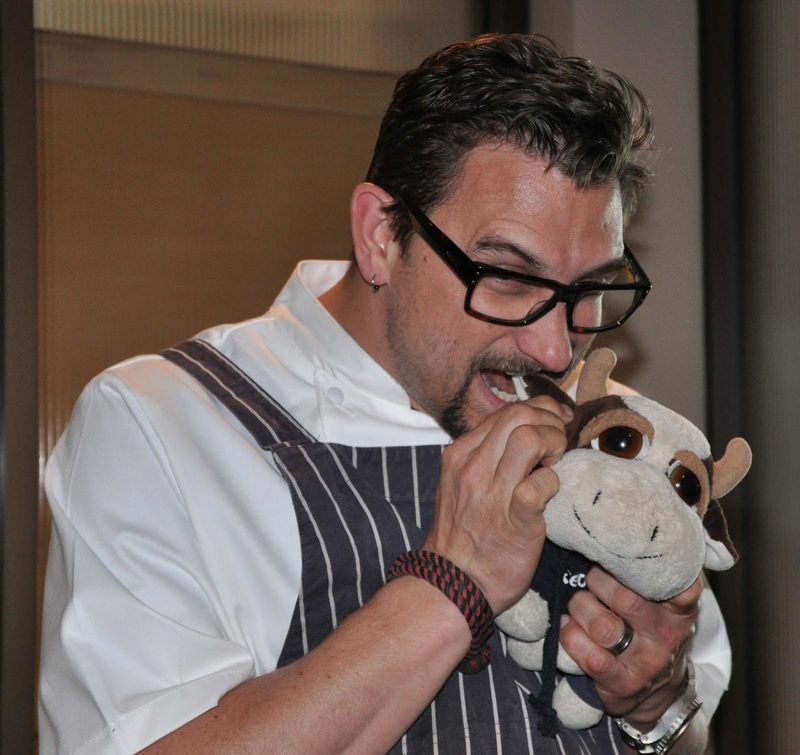 Chris Cosentino is recognizable by most as being on the The Food Network, having guest starred and hosted several shows, as well as being one of the Top Chef Masters winners. As part of the Chef in Residence program, there is a public event in honor of the Chef in Residence held at Ernest’s. Ernest’s is a fine dining restaurant created and run by NAIT that allows Culinary Arts and Hospitality Management students the opportunity to practice and hone the skills they learned in the classroom in a real kitchen and restaurant, cooking for and serving paying diners. They are open for lunch, dinner and even offer a Chefs Table. NAIT hosted a luncheon this year in honor of Chris Cosentino, where the NAIT Culinary Arts students cooked a four-course menu from his new book, Beginnings: My Way to Start a Meal. We wound up being seated with a group of people in the food industry, including Kris Armitage, the manager of Everything Cheese, Cyrilles Koppert, owner of two of Edmonton’s long standing The Manor Casual Bistro and Urban Diner, and Alex Sneazwell, Executive Chef of The Manor Casual Bistro. It made for three hours of interesting and entertaining conversation! The first course up was Dungeness crab, fregola, chilies and fennel. The pieces of crab were large and plump. The entire dish was very delicately balanced, as I was able to taste crab broth, fennel and chilies all individually. I was surprised that the chilies were detectable without over powering the delicate crab. 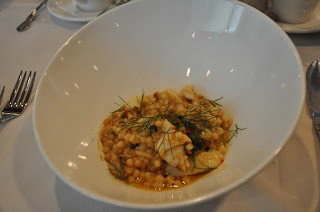 The fregola in the crab broth was creamy and thick. Chris Cosentino informed the diners later that it was thickened with blended crab guts, which can be used as a thickener once it begins to congeal. This allowed every part of the crab to be used instead of going to waste, a more sustainable way of cooking. 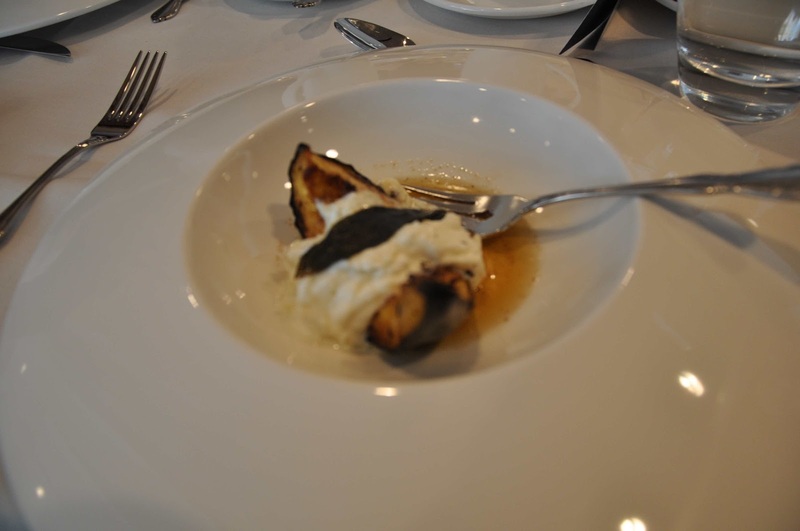 Next we were presented with acorn squash, stracciatella and sage. The roasted squash was soft and sweet, the cheese was luxurious, while the brown butter caressed each bite. 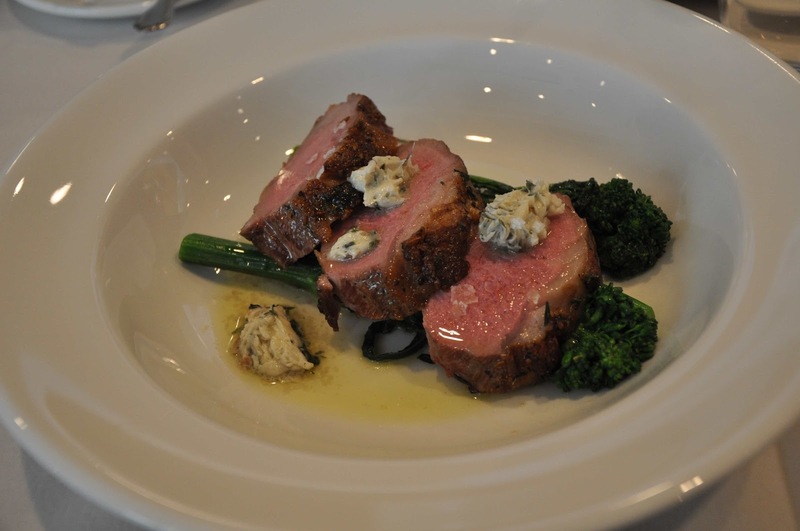 The entrée of lamb with anchovy butter and mint was expertly cooked. The lamb was medium rare, very tender and flavorful, while the anchovy butter surprisingly did not overwhelm the lamb, and didn’t have a strong salty taste as I was expecting. 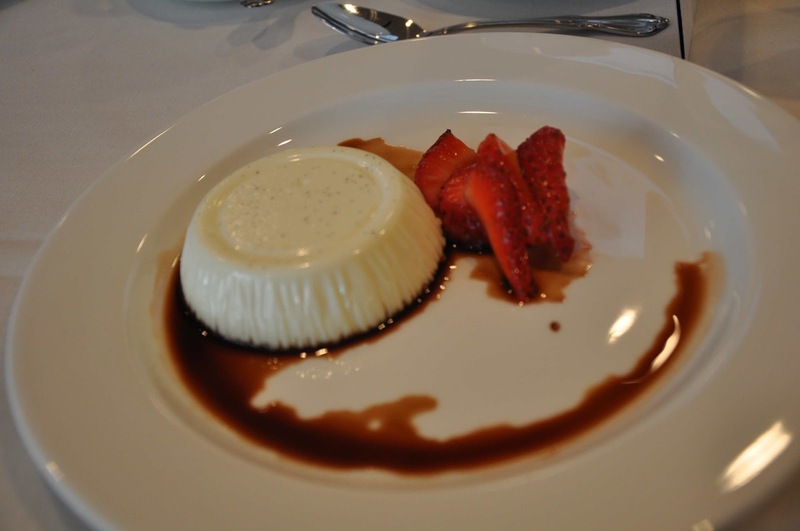 To finish the meal, the students prepared a bay leaf panna cotta with balsamic and black pepper. I have to admit that I usually avoid choosing panna cotta for dessert, as I’m not a big fan of desserts that jiggle like panna cotta and jello – yes, I realize that’s a bit weird. However, this panna cotta was smooth, creamy, and rich, yet felt light. The dessert also had a savory element to it with the acidic balsamic vinegar acting as a sauce and the mildly pepper taste inside it. The only hiccup of the luncheon was the service, as it was the first day the NAIT Hospitality Management students was serving, so it took a while for each course to reach the diners. On average, it seemed to take half an hour between courses, making the entire luncheon about 3 hours long, with a lot of people at our table texting or calling work to let them know that they would be later than originally anticipated returning to work. Unfortunately, this meant that the humans were unable to linger afterwards to try to get me a photo with Chris Cosentino. Particularly since many people there wanted to meet him, and according to NAIT staff that it might be a bit of wait as he was in the kitchen with the students. @marlowmoo come by today to Ernest and I can take a photo today. 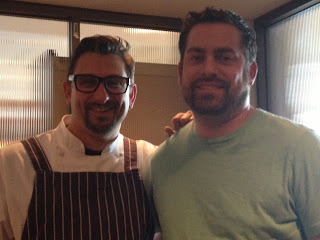 Luckily and amoozingly for Moo, after tweeting that I wanted a photo but was unable to obtain one at the lunch, he (@offalchris) tweeted a reply and invited me down to Ernest’s the next day to meet him and get a photo. It was also the day of the all day snowstorm in Edmonton. Luckily Chef Matt Phillips, a Chef at Lux Steakhouse, my unofficial photographer for the day and one of my favorite chefs in Edmonton, and mooself managed to get there in one piece via public transit, determined to to meet Chris Cosentino! Even luckier was that the bus we took got stuck in snow just after we got off at NAIT. Thank you to Chris Cosentino for taking the time to meet Moo so I could get a photo! As well as taking the time to chat with Moo and Matt! He was a very approachable, down to earth and friendly guy! I hope that some day I get the chance to dine at his restaurant, Incanto, in San Francisco, as well as visit Boccalone, his artisan salumi store. Also congrats to the NAIT Culinary Arts students, as you made a wonderful meal! Overall I was very impressed with the students’ abilities and think that the future of Edmonton’s culinary scene will be in good hands if the NAIT Culinary Arts students are this capable already. I look forward to visiting Ernest’s on another night to see what other delicious things the student’s can create.